Red wine lovers, look out. What this wine has is a very particular set of skills. Skills it’s acquired over a very long time, skills that make it a nightmare for people who don’t like cabernet. Because it’s so glorious. If you give in to its powers now, that’ll be the end of it. It will not look for you. It will not pursue you. But if you don’t, It will look for you, It will find you, and it will probably kill – your wallet. Because it is outrageously lovely to drink. 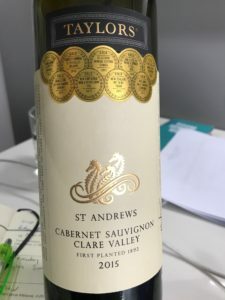 The Taylor family went to the bank back in 1995 and asked them if they’d do them a solid and let them purchase the historic St Andrews vineyard (planted back in 1892) so that they could step their cabernet sauvignon up a notch. You could, based on the incredible number of gold medals on its grill, deduce that this wine is more than a tad flash. You’d be correct, but I have to tell you just how incredibly seductive and alluring it is. Espresso, cocoa, and sweet, ripe plum and boysenberry flavours burst from the glass, and they’re cuddled by cedar, smoke, and silky spices. It’s generously proportioned, velvety, elegant, and incredibly delicious with Cantonese beef swimming in rich pepper sauce.